Varun Dhawan’s Judwaa 2 has emerged as a true winner at the box office with the first-week collection of around 98 crores. 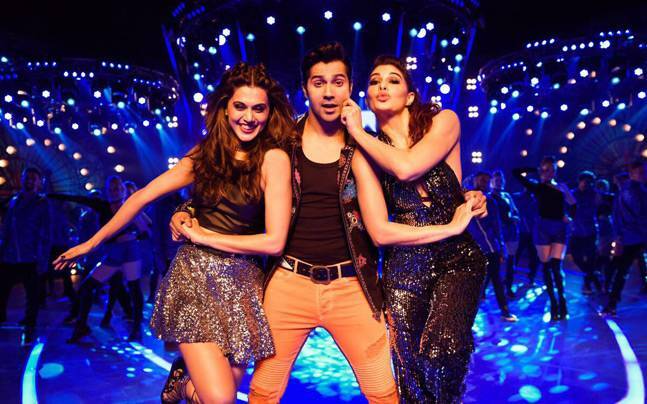 Judwaa 2 first week box office collection: After a superb extended opening weekend with the collection of 77.25 crores, Judwaa 2 holds well on weekdays. The movie has so far performed exceptionally well and is all set to enter 100 crore club. With around 98 crores collection in the first week, it has a chance to become the highest grossing movie of the year.Currently, Shah Rukh Khan’s Raees is the highest grossing Bollywood movie of the year with the collection of 138 crores. After an incredible opening day with the collection of 16.1 crores, the movie saw huge growth over the first weekend. It earned 20.55 crores and 22.60 crores on Saturday and Sunday taking the first weekend total to 59.25 crores. On Monday, the movie took full advantage of the national holiday and earned 18 crores. After a huge extended weekend, the movie remained steady on weekdays. It earned healthy 8.05 crores on Tuesday followed by steady 6.72 crores on Wednesday. On the last day of the first week, the movie earned around 5.5 crores to take its total collection to 97.52 crores. With the collection of 97.52 crores, Judwaa 2 becomes the fourth highest opening week grosser of 2017 Bahubali 2, Tubelight and Raees. It has beaten the first-week collection of movies like Toilet: Ek Prem Katha, Jab Harry Met Sejal, Baadshaho and Jolly LLB 2. With the collection of 97.52 crores, Judwaa 2 is now the 8th highest grosser of the year. It will soon become the highest grossing movie of Varun Dhawan by beating the lifetime collection of Badrinath Ki Dulhania. Made on a budget of around 75 crores, Judwaa 2 needs to earn more than 100 crores to be called a hit at the box office. The hold on second Friday will decide how much money the movie will eventually earn in its lifetime. Saif Ali Khan’s Chef is receiving good reports and it will be interesting to see how much will it hamper Judwaa 2.